At 15 miles long and a half mile deep, Zion National Parks majestic sandstone cliffs soar above in a beautiful blue sky. Narrow slot canyons and dramatic backdrops are at every turn. You will see amazing diverse plants and animals. 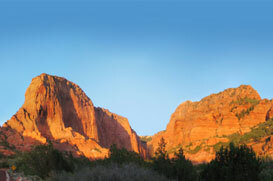 Zion’s rich history and adventures are abundant. Only a short 45 min. drive from St. George.